Go to original pattern for design DROPS 186-4. 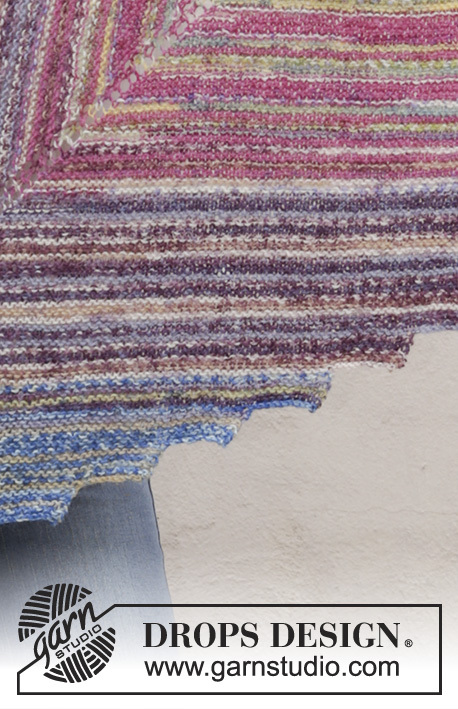 Knitted shawl with garter stitch and stripes. The piece is worked in DROPS Fabel. 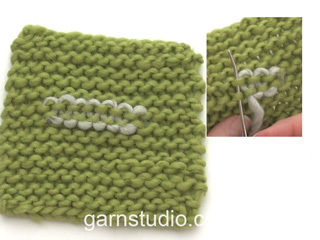 DROPS CIRCULAR NEEDLE (60 or 80 cm) SIZE 4.5 MM – or the size needed to get 20 stitches and 40 rows garter stitch on 10 cm in width and 10 cm in height . Work stripes as follows (NOTE! Change strands at the end of a row from the right side). Work 12 cm with pink dream. Work 12 cm with lavender. Work 12 cm with sea mist *, repeat from *-*. 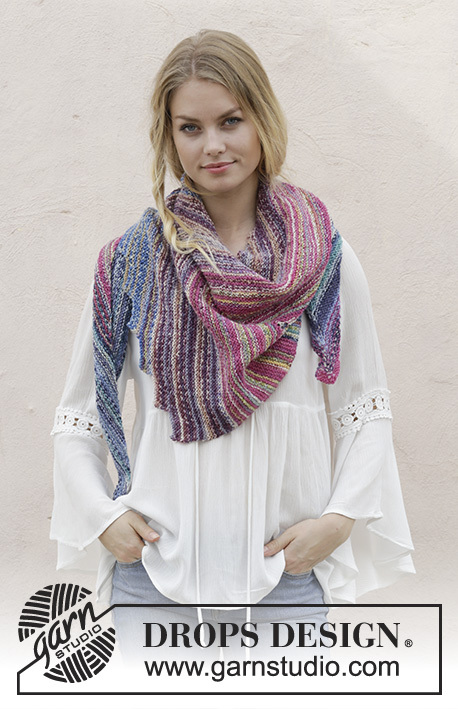 The shawl is worked from the one short side and across. ROW 1 (from the right side): Knit 1, 1 yarn over, knit 1 (stitch with marker thread), 1 yarn over, work until there are 2 stitches left, knit 2 stitches together. ROW 2 (from the wrong side): Knit 2 stitches together, knit to end of row, yarn overs are knitted to leave holes. ROW 3 (from the right side): Work as far as the stitch with the marker thread, 1 yarn over, knit 1 (stitch with marker thread), 1 yarn over, work until there are 2 stitches left, knit 2 stitches together. ROW 4 (from the wrong side): Knit 2 stitches together, knit to end of row, yarn overs are knitted to leave holes. 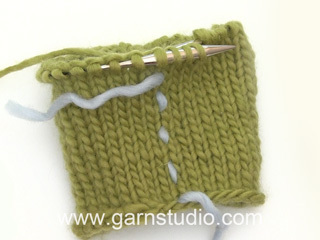 Repeat rows 3 and 4 upwards, continue with 1 yarn over on each side of the stitch with the marker thread and decreases at end of rows from the right side and beginning of rows from the wrong side. The number of stitches stays the same upwards. Continue until you have increased 80 times on each side of the marker thread = 164 stitches on needle (worked 160 rows). ROW 1 (= from the right side): Cast off the first 10 stitches on the needle, work to the stitch with the marker thread, 1 yarn over, knit 1 (= stitch with the marker thread), 1 yarn over, work until there are 2 stitches left, knit 2 stitches together. ROW 2 (from the wrong side): Knit 2 stitches together, work to end of row, yarn overs are knitted to leave holes = 154 stitches on needle. ROW 3 (= from the right side): Work to the stitch with the marker thread, 1 yarn over, knit 1 (= stitch with the marker thread), 1 yarn over, work until there are 2 stitches left, knit 2 stitches together. ROW 4 (from the wrong side): Knit 2 stitches together, work to end of row, yarn overs are knitted to leave holes = 154 stitches on needle. 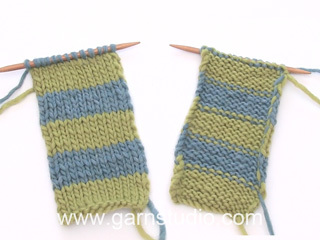 Repeat rows 1 to 10 upwards, you decrease 10 stitches every 10 rows. Continue until there are 4 stitches left on needle, cast off these stitches. Cut and fasten the strands.